Baltimore, MD – Mar. 7 – How often does one have the opportunity to hear Elli Kranzler, Rivi Schwebel, and Yussi Sonnenblick, aka Dveykus, live? According to Elli Kranzler, it has been about 15 years since the group has been together in such a forum. Thanks to the efforts of Shomrei Emunah and its concert committee chaired by Stuie Schabes, last night – Rosh Chodesh Adar Sheini 5771, Baltimore was privileged to enjoy a sold out Dveykus Reunion Concert at Shomrei. The band, directed by Nochi Krohn, included Gary Honick, Nossi Gross and other members of the Zemer Orchestra. 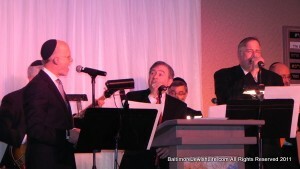 They accompanied Dveykus in this sold out performance of over 600, as the group led the audience on a musical journey through a repertoire that highlighted the best of Dveykus’ classics. These inspirational melodies included Lev Tahor, Shema Koleinu, V’lirushalayim, Shalom Rav, Boei V’Shalom, Yedid Nefesh, Ka Ribon, Habein Yakir Li, Kol B’rama, LaKol Z’man Va’eis, Hamalach, Ani Maamin, In A Vinkele, Journey’s Its Time to Say Good Shabbos, The Place Where I Belong, and Naar Hayisi. Each song’s introductory anecdote was heartfelt and timely and each song was sung with inspirational energy. As the evening came to a close, and following a standing ovation from the audience, the Dveykus members led everyone in a leibedig rendition of Mishenichnas Adar Marbin B’Simcha. The men danced in a large circle as the simcha filled the room. It was truly a remarkable evening and one that will be cherished for a long time.